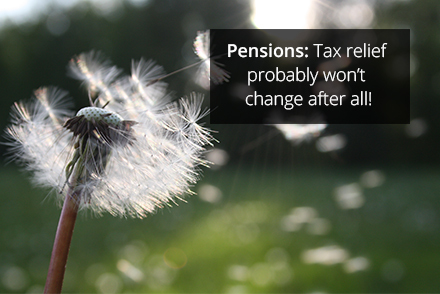 Pensions: Tax relief probably won’t change after all! Following my previous blog post about how it seemed likely that higher rate tax relief would be removed at the Budget in a few days’ time, I now have an excuse to merge a blog post about technology and pensions! I know, terribly exciting isn’t it! I was minding my own business on Saturday morning as we made the usual last minute arrangements for our son’s 5th Birthday Party that afternoon when my digital assistant Cortana popped up on my phone and told me that I should read an article in The Telegraph which I might find interesting. Cortana does that a fair amount and tends to pick stories about cars, Liverpool FC (including, annoyingly, when we lose) and sometimes about Financial Services. The original article seems to have disappeared but a similar one can be found here. We’ve spent the last few months talking to clients and saying that we don’t like planning for possible changes to legislation but this one, the removal of higher rate tax relief, seemed to buck the trend and was more or less guaranteed to happen. As it happens, like most things in financial services it seems, what we expected to happen and what is now likely to happen are rather different. The Chancellor will probably leave pension taxation alone, although of course we won’t know until next week. That’s a good thing for those who enjoy claiming tax relief and saving hard for their future. It seems less clear that it’s a good thing for the UK’s deficit as removing tax relief would have generated significant savings, but that is another story for another day. It therefore seems that, after much conjecture, that nothing much will change after all. We will know for sure on 16th March.